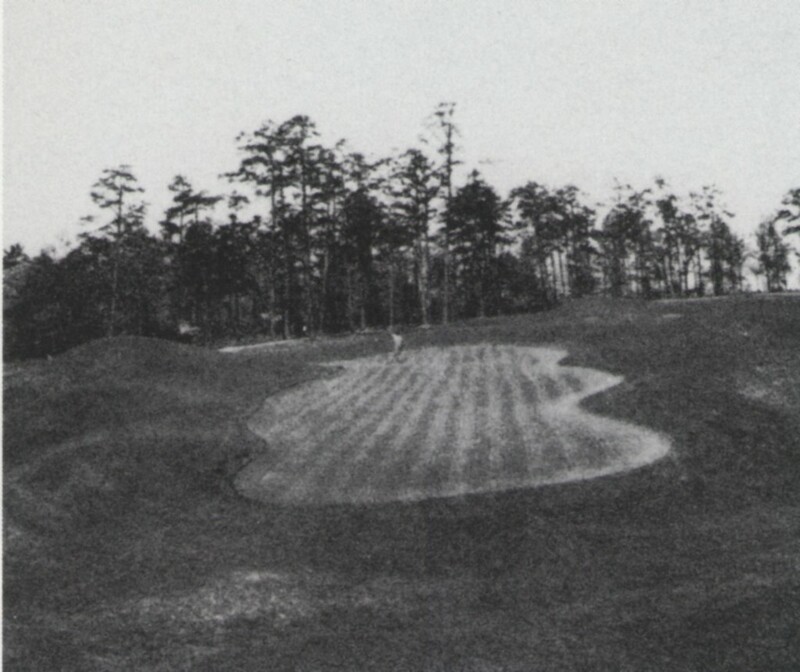 Eighth green, Augusta National, 1930s. Photo by Tony Sheehan. My Golf Digest colleague Ron Whitten and I recently spent a couple of days in Orlando with the video-game designers at Electronic Arts, the creators of Tiger Woods PGA TOUR. The game’s next edition will include a recreation of the Augusta National course as it was in 1934, the year of the first Masters, and Ron and I had been asked to help the game’s “environment modelers” make the virtual course as historically accurate as possible. We offered suggestions about everything from green contours to mowing patterns to the size and placement of individual trees—an experience we’ll both be writing about for the April issue of Golf Digest. Tony was an oddball in appearance and dress, and he made comments at times that were just as unusual and unexpected. Neither he nor his battered old camera looked to be qualified to make even a passport photo, but he was a remarkably capable photographer . . . . Many of us experience accidents as we go through life, but I doubt that any man endured bad luck so often and so continuously for so many years as Tony Sheehan. Every time an epidemic of any kind came to town, Tony was the first to catch it. Tony tripped over something and broke one or more bones so often that it almost appeared to be a habit. On one occasion, while he was waving to friends, his car plowed into a large stone marker on Walton Way in Augusta, which cost him a number of teeth but gave him some distinctive battle scars on his face. . . .
Tony survived a half-dozen major operations, plus numerous patching-up jobs. His one lucky day was when he was married to the nurse, Eva Smith, who had looked after him in the hospital so many times that she felt lonesome between his visits. Tony finally got himself into really serious trouble—his car was hit by a train. Over a year’s period the hospital lost track of the number of jobs that had to be done on Tony. Finally, the great day arrived when he could leave. His wife picked him up in her car and headed for home. When they arrived at the railroad track, the same one where Tony was wrecked, he asked her to stop the car. He then walked ahead and looked in both directions to make sure no train was approaching. As he was about to signal her that all was clear, her foot slipped off the clutch and she knocked Tony down. Whereupon she picked him up and took him back to the hospital for another stay. Believe it or not, our friend Tony Sheehan lived to be eighty years of age, and died in 1974 of natural causes. 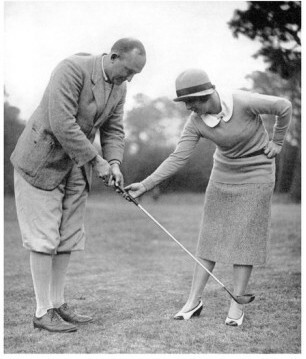 In 1931,”Hard Luck” Tony Sheehan took this photograph of Ty Cobb receiving a golf lesson from Glenna Collett Vare, who won the U.S. Women’s Amateur six times. Cobb was from Augusta, and this photograph was taken there–possibly at Augusta National, although more likely at Augusta Country Club, next door, where Cobb was a member. Roberts himself knew something about hard luck. He grew up poor in a succession of small towns, accidentally burned down his family’s house when he was sixteen, lost his mother to suicide when he was nineteen, earned a modest fortune and then lost it in the stock-market crash of 1929, and presided over Augusta National’s bankruptcy in 1935, a few months after the second Masters. Like Tony Sheehan, though, he persevered, and because he did we have the Masters—now just over three months away. This entry was posted in Golf Courses, Masters, Tiger Woods, Tournaments and tagged Augusta Country Club, Augusta National, Clifford Roberts, Electronic Arts, Glenna Collett Vare, Ty Cobb by David Owen. Bookmark the permalink.